On the mainland, I am averse to McDonald’s. But when I’m in Hawaii, McDonald’s is a required stop. It’s as important to me as the beach because of two reasons: the Local Breakfast Platter and the fried haupia pie. The local breakfast is something you can only enjoy at the McDonald’s here in the Aloha State. It consists of steamed rice, an omelet, and your choice of Hawaiian breakfast meat: either Spam or Portuguese sausage. On Oahu, a platter of this breakfast with one meat costs about $6, or you can have both for a dollar more. And now because of the company’s All-Day Breakfast push, the Local Breakfast can be had for lunch or dinner. The all-day availability, as I discovered on this trip, seemed to have only improved the quality. My platter tasted like everything was cooked to order. The Spam had that just-from-the-griddle crust, the Portuguese sausage was juicy, and the egg was creamy. All of it, of course, was perfect with rice, which I promptly seasoned with a packet of Aloha, a locally-produced soy sauce. This brings me to the haupia pie, which is so good and unique to Hawaii’s McDonald’s that I always buy a bunch to bring on the flight home. It is simply a marvel of the old-school McDonald’s fried pie crust filled with the light, clean-tasting Hawaiian coconut pudding oozing from the inside. I wish Zippy’s existed in my neighborhood on the mainland. I found multiple locations of this Hawaiian fast food chain in Oahu and it is the kind of eatery I would frequent everyday if I was given the chance. - And a slice of Spam. It’s all served on furikake-showered bed of rice, which is, come to think of it, also how I wish all bowls of rice are served on the mainland. Compared to the overwhelming variety of food options in Oahu, the choices you have when visiting Molokai are extremely limited. This, however, doesn’t mean there aren’t great places to eat. One is Molokai Burger, found in the middle of Kaunakakai, the island’s main town. They make a decent burger of the smashed variety, served in a dining room that looks suspiciously copied from In-N-Out. But the real attraction is the fried chicken plate lunch, where you get two gigantic pieces of hen—one drumstick and a meaty breast—paired with a scoop of rice and mac salad, all for about $9. The chicken skin is rendered perfectly to a crispy fleck; the meat is juicy and seasoned; and you’ll end up spending less here than at the other 12 eating establishments on the island. I’ve been to the Hawaiian islands a total of 11 times now, and from those trips I’ve learned that when you want poke, you don’t buy it at a restaurant or the resort. You need to go to a supermarket. And if you can find a Foodland, all the better. There’s a Foodland in virtually all the islands I’ve visited (at this point, I’ve been to each of the inhabited ones except Niihau), and without exception, each bowl of poke I’ve had there is not just exemplary, but also cheap. $6.99 gets you a poke bowl brimming with pre-marinated cubes of ahi (not the build-your-own stuff you see on the mainland) in at least a half dozen different flavors. That price would be a good deal for mediocre poke, but it’s a complete steal when you consider how fresh and vibrant Foodland’s always is. I don’t know why Giovanni’s, arguably the most famous shrimp truck found on the North Shore of Oahu, gets all the attention when there are so many other shrimp trucks on the island. But we couldn’t not get in the long line at this makeshift outdoor food court made up of at least three other food trucks. And the shrimp scampi here is undeniably good if not something I can conceivably make at home with some fresh shrimp, olive oil, minced garlic, and lemon. Let’s face it: all there really is to this dish is just those things. But I know that when I do attempt to recreate it in my own kitchen, it won’t taste the same. It will be missing an essential component: the experience of eating it in Oahu’s North Shore and then bragging on social media to say that I did. $95 would seem a lot to pay for a meal, but when you shell out this amount at Alan Wong’s in Honolulu for its signature 5-course prix fixe, you are getting a downright bargain. This Oahu institution, which has been in business for more than two decades, has rightfully been praised by every food magazine as one of the best restaurants in the country. 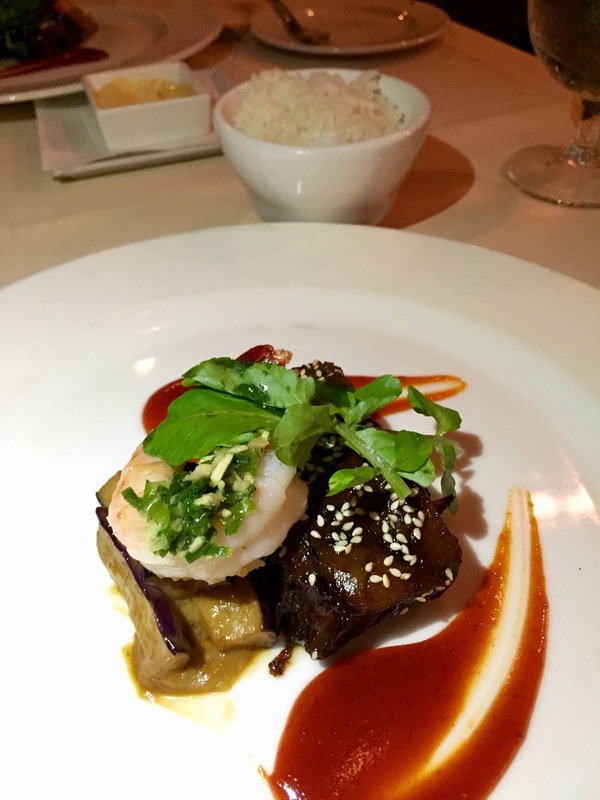 Wong has also been recognized by the James Beard Foundation as one of the Best Chefs of 1996. But after visiting it for the first time, I’d argue that even to this day, Wong and his eponymous restaurant still deserves the distinction. First a warning for those who have not dined here but plan to: Alan Wong’s is not located in the safe confines of a resort, nor does it have a beach or ocean view. It’s found on the third floor of squat office building amidst an inner-city neighborhood that will make you think you’re deep in the heart of LA’s San Fernando Valley. If you were teleported here and looked out the window, you would not guess you were in Hawaii. But as soon as you walk in, the effortless island charm you’d expect from a people whose state thrives on tourism is very much in tact. The staff is impeccably warm, friendly, even chummy. Every person I interacted with, down to the valet, was as happy to be here as I was. This, in turn, made me even more happy. They do everything to make you feel like a V.I.P., especially if you’re celebrating a special occasion. They will print out a special menu with the celebrant’s name on top. 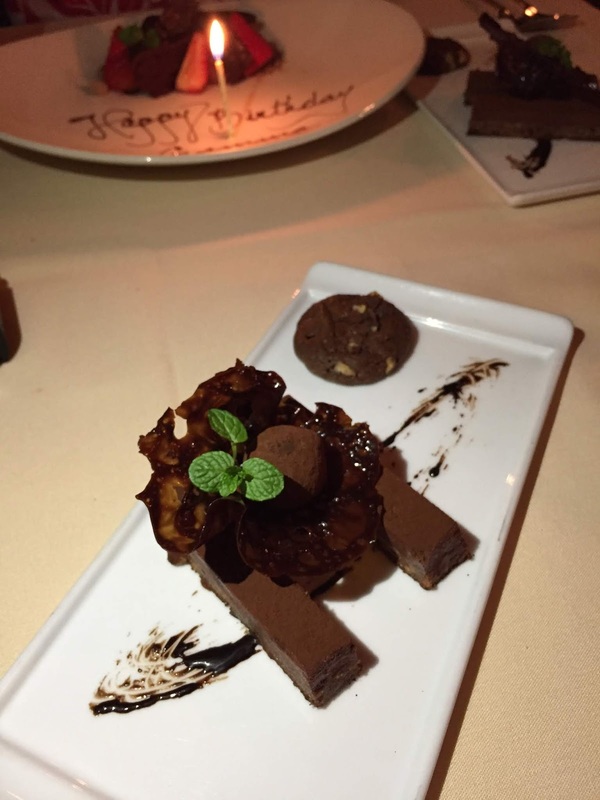 The menu is also signed by the entire staff, and at the end of the meal, if you’re commemorating a birthday, they will bring out a complimentary slice of chocolate cake on a personalized plate complete with a lit candle. It’s not as if you’ll need the cake. If you order the prix fixe, it already comes with a dessert course, one that we couldn’t finish. After eating all the free bread slathered with spicy aioli, and then the four nearly full-sized portions of Wong’s most popular dishes, we were stuffed. 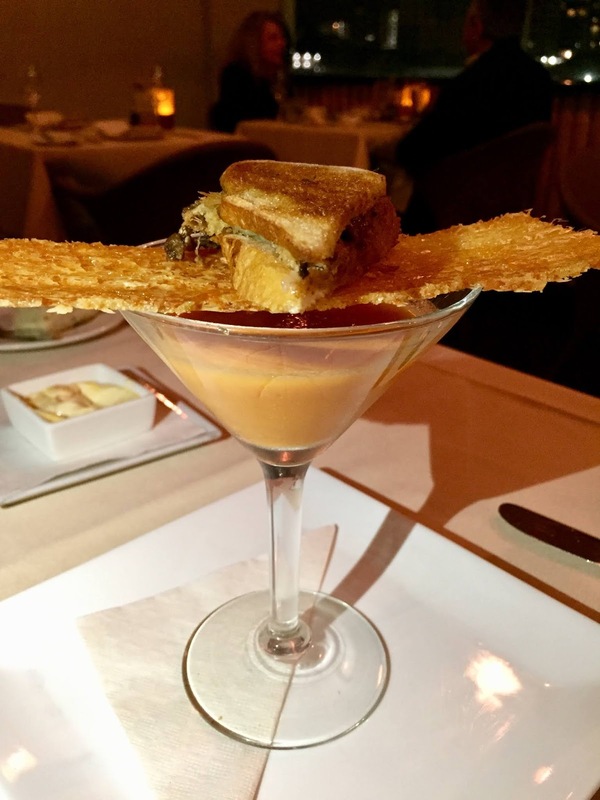 It started with a “Soup and Sandwich”—a martini glass filled with chilled tomato soup, and a triangle of a foie-gras-kalua-pig-mozzarella grilled cheese sandwich. The sandwich sat on a plank of Parmesan crisp set like a bridge on the rim of the glass. As I alternated between bites of the sandwich and sips of the gazpacho-like soup, I realized the genius behind this dish. 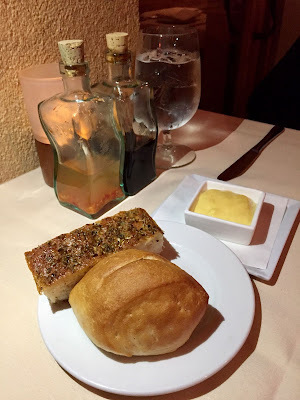 The spicy, cleansing, and refreshing soup balanced the warm and decadent richness of the pork and foie. It’s hard for me to think of a more thrilling dish that I thought looked ordinary and unimpressive at first glance. 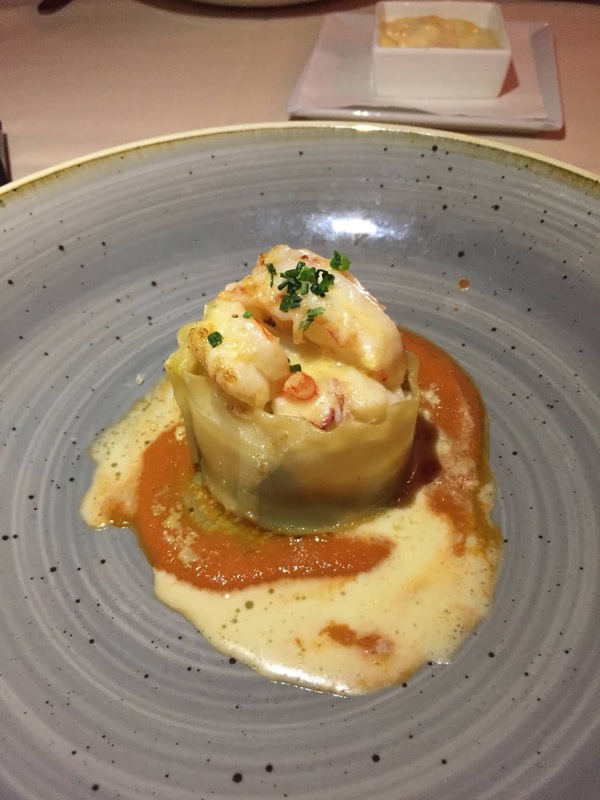 Next was a Keahole lobster and shrimp lasagna with garlic tomato sauce, which the waiter advised should be savored slowly and not inhaled. Heeding his advice, I ate each component in as small a bite as I could muster, letting each morsel linger in my mouth before I swallowed. 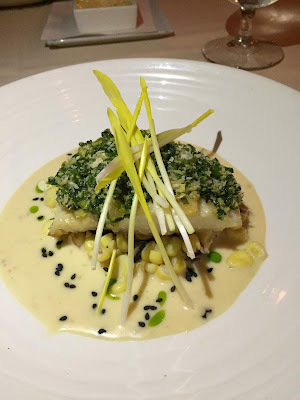 The fish course was a ginger-crusted Onaga (Long-tailed Red Snapper) with miso sesame vinaigrette, mushroom, Nozawa corn, and baby corn sprouts. The dish was by itself a revelation: a ginger-scented and perfectly cooked fillet served over a tangy, umami-packed sauce that was dotted by crisp corn kernels as sweet-as-candy. But then came the piece de resistance: a garnish of baby corn sprouts. For me, it pushed this dish from “great” to a bonafide “revelation”. If you’ve ever wondered what a corn husk would taste like if it were edible, this is it. And it’s incredibly sugary, grassy, and tastes of summer. For the meat course, the kitchen put out a “surf and turf” plate that’s basically Hawaiian food culture distilled onto a few square inches. The “turf” was a twice-cooked short rib (soy-braised and grilled kalbi-style) moist and tender enough to be pulled apart with a gentle tug of the fork. The braised beef, above all, should be used as a lesson for all chefs on how it should always be prepared. The “surf” was a single shrimp gilded in wilted green onion, two simple ingredients that, when put together, becomes greater than the sum of its parts. And for the vegetable, there was luscious eggplant spears cooked in miso while splotches of a sriracha gochujang sauce decorated the plate. As Wong is not just a great chef, but also a practical one, he knows no dish like this would be complete without a bowl of rice. And as if on cue, it arrived right after the server explained all of the components. Finally, as we were already bursting at the seams from the savory dishes, the sweet course arrived. It was an assortment of chocolate desserts that included a house-made “Waialua” milk chocolate macadamia nut crunch bars that could bankrupt the Mars candy empire if it ever went to mass market. Next to it, there was a truffle filled with salted caramel, a crispy tuile, and a perfect cookie that was at once crispy on the outside and chewy on the inside. Izakaya Takasei in Fullerton used to be a Honda-Ya. It split off some years ago, but the DNA it shares with the original are still there. You see it with the tatami rooms, the sake-fueled convivial atmosphere, and especially the kushiyaki, which are roasted over the same white hot heat of binchotan coals. If you haven't done it, wrangle up a couple of friends and save some money to do the kamayan at MFK by Aysee. You'll need about $40 per person for the eat-with-your-hands communal meal experience where rice is laid out on a table lined with banana leaves and then six different proteins of your choice are piled on top. But if you're cash-strapped and you just want something quick and simple, get MFK's sisig bowl. It contains rice as the base, sisig, and a sunny-side up egg, all for about $8. If you're new to sisig, you're in for a treat. Sisig--a classic Filipino street food designed to be eaten with beer--is basically fried pieces of pork and crispy skin all chopped up to bits, then tossed with a little onion, garlic, peppers, and citrus juice. Mark my words: when Filipino cuisine reaches Chinese take-out food ubiquity in the US, sisig will be as beloved as Orange Chicken. So try it at MFK now so you can say you got in on the ground floor! 2620 W. La Palma Ave.